Be considerate of your allergy-prone guests. 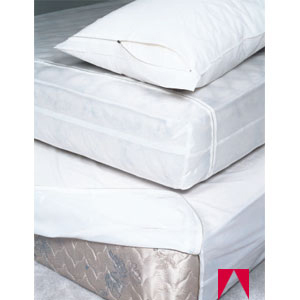 Heavy-duty covers of translucent virgin vinyl with a brushed silk finish protect mattresses from moisture, wear, and dust. Durable and stain proof. Antibacterial Ultra-FreshŸ keeps mattresses smelling fresh and clean. Made of 6-gauge vinyl before embossing. WonÃt crack to -15 degrees F. Strong electrically welded seams. Flame-retardant. Zippered styles feature smooth-gliding rustproof zippers. Imported.